There was a time when balloon ascensions were popular attractions at county fairs and other venues all across the United States. 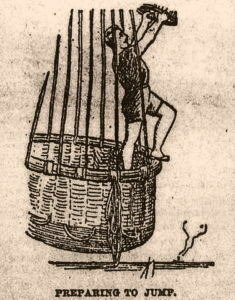 To draw larger crowds, some aeronauts took to making daring parachute jumps, or “drops” from their balloons, generally from altitudes ranging from 2,000 to 5,000 feet, although there were some who jumped from much greater heights. 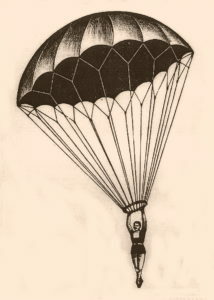 The parachutes were usually of the aeronaut’s own design, made of linen or silk, and attached to the outside of the balloon, and not in a pack strapped to the back of the aeronaut. 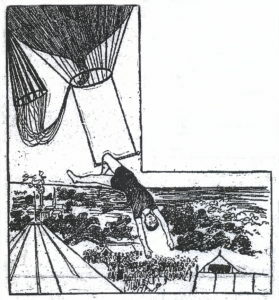 When the aeronaut left the balloon, he (or she) would hold on to a ring at the bottom of the parachute, or sit upon a trapeze suspended beneath the parachute, and maintain a hold until landing. However, there were some who would perform acrobatic feats with the trapeze during the descent. As one might expect from such an arrangement, not all parachute “drops” ended well. The following illustrations from the late 1880s depict how such feats were accomplished. Balloon ascending with parachute attached to the side. 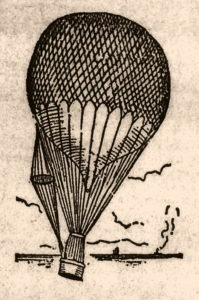 The top of the parachute was attached to the balloon in such a way that when the aeronaut dropped, his weight would cause it to release. Aeronaut Preparing to Jump With Parachute. For obvious reasons, leaping from a balloon under these circumstances required one to be in top physical condition. Upon leaving the balloon, the aeronaut would free fall for 100 feet or more before the parachute (hopefully) opened with a jerk. Therefore it was necessary to maintain a strong grip lest he be yanked free by the jolt. The grip then had to be maintained for at least two minutes or more while making the descent. If landing on earth, he had to be agile enough to “tuck and roll”, and if on water, a good swimmer. Captain Thomas Baldwin, a well known aeronaut, balloonist, and airman of the late 1800s and early 1900s, described to a newspaper reporter what it feels like to make a parachute drop from a balloon. The following excerpt is from the December 15, 1887 edition of the Democratic Northwest, a now defunct Ohio newspaper. 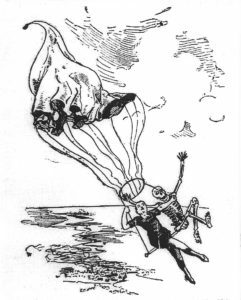 In 1892, Louis H. Capezza, (1862-1928), developed what he called a “parachute-balloon” in which the parachute served as the upper netting for the balloon until ready to deploy. (See illustration below.) 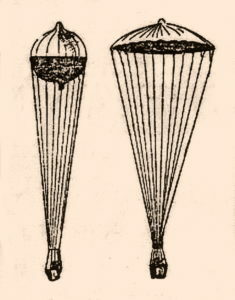 If the balloon suddenly burst, or developed a leak, the aeronaut would be saved by an automatic deployment of the parachute. The balloon could also be manually opened via a rip cord operated by the pilot. Mr. Capazza also developed the concept of utilizing a parachute as an “air brake”. Sometimes, for various reasons, a balloon would rise too fast, or continue to rise higher than the aeronaut intended. Capazza reasoned that by placing a folded parachute beneath the balloon that could be unfurled in such a situation, the rapid ascension could be slowed or stopped.